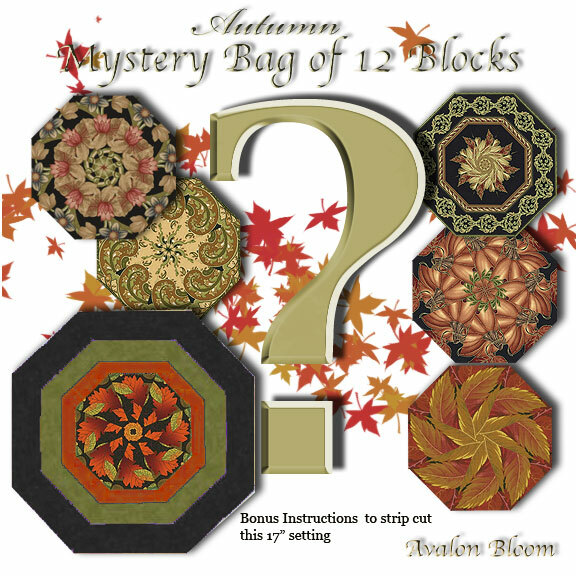 This is a sampler of 12 different Autumn quilt blocks. There are no duplicate fabrics and no two blocks will be exactly alike. It is a mystery revealed as each one blooms before your eyes. This is a precut Mystery Kaleidoscope Quilt Block Kit to sew a set of 12 unique quilt blocks. Give individual blocks as gifts to fellow quilters made up or unsewn. The blocks do not include the corners to make them square so that you may choose your own for each project. This will include instructions to strip cut the corners to make the blocks 8 inches square as well as bonus instructions to strip cut the 17 inch octagon setting. Each block measures 8 1/2 inches square when sewn with corners. Each block in the set will be uniquely different due to layering the fabric in exact repeats to rotary cut them from 100 percent cotton fabric. Our Blooming Blocks© are specially cut so that the centers lie flat and no bias on the perimeter of the block so it lies flat in your quilt. The fabrics may be from Moda, Benartex, Hoffman, Kaufman, Cranston or other quality quilting fabrics, all 100% Cotton. Illustrated instructions included to complete the blocks that even a beginner can understand. Use each block as a focal point in a King, Queen, Double, Twin or Baby Crib quilt, wall hanging quilt as well as a Table Runner or Placemats.